A Breakup Coach and the world's first Banking from Breakup Educator, Coach and Expert, Lindy Lewis is this series' 29th spotlight and episode 027 of the Thank You Heartbreak podcast. After reading Lindy's breakupward story spotlighted below, inviting her onto my podcast was a no brainer. It was a Sunday afternoon and we both had aromatherapy billowing out of our diffusers. The Wall Street Journal had just run a feature on the emergence of breakup therapy and coaching, echoing our own efforts to support others in choosing to use their breakup to their advantage. 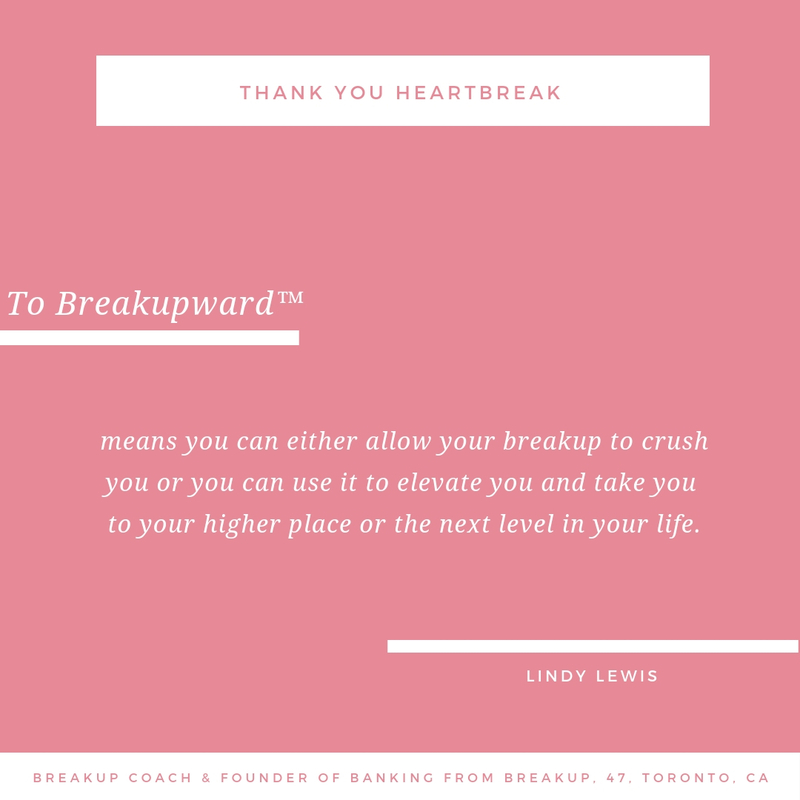 Yes, Lindy and I both believe the choice is ours—will we breakdown or breakupward in thanks to heartbreak? As you'll hear from Lindy in the podcast and within this spotlight, it's possible to lose yourself in love and only find yourself once self-love is the sole option. She talks about the ease, and disappointment, in which one can fall both in love and asleep at their own wheel. We've all heard of it before—love can blind us. The thing is, so often we are told that it blinds us to our partner, to their shortcomings and falsehoods, when the reality is far worse. Love can blind us to ourselves. Truly, you can bury your own dreams for a decade. You can lose sight of yourself for that long. This is Lindy's story and it's a story of tremendous success. What stuck out to me the most is, how long she lost herself and yet how quickly she won herself back. As she'll tell you, though, the process wasn't easy or without pain. It took time. But not only time. It took feeling the feelings and breaking with intention. The question that propelled her the most? "What would happen if I banked spiritually, emotionally, mentally, physically, and financially?" Now that is a question for a visionary and a victor. When she said it during our call, I got chills, my imagination lighting up with direction. I hope Lindy's story will touch your heart and charge you up too. If it's true that your ex owes you nothing, what do you owe yourself? If you glowed differently and moved differently in the wake of your breakup, what would that look like? How would you feel in your body? When was the last time you befriended someone? How did you approach them or how did they approach you? What made you want to invest in their friendship? What would you need to do to begin investing in a better, stronger, more forgiving relationship with yourself? What would you apologize for? How would you compliment yourself? What part of yourself would you want to be seen, heard, and loved first and foremost? And finally, what is happening to you right now? What is your life trying to teach you? 1. Do you think your success is a product of something you already had inside of yourself but relationship priorities either delayed or distracted you from going after or do you think solitude and loss themselves drove you to want more for yourself? If I am being honest, yes. For years I was missing in action from my own life. Somewhere along the way I became a passenger in my life. The tough part was realizing that while I tried to shape and mold my life to someone else's, I had disconnected from my own. I lost me. The exact same thing I said I would never do, I did. This situation nearly derailed me from my destiny. But I am so glad I woke up and came to terms with things. If I had continued in the relationship I would have delayed my destiny further. 2. How did you adjust your mindset after your breakup so, instead of focusing on what was lost, you focused on what you could gain? I realized that I had subconsciously bought into the Prince Charming fairytale for all those years in my relationship. Once I realized this, it was easy to adjust my mindset. I was focused on becoming my own “Prince Charming” and getting back in the driver’s seat of my life. I created a new daily routine. I adopted new daily habits and a specific mindset practice. I started keeping a gratitude journal, doing affirmations and visualizations, diffusing essential oils. The best thing I did to make my mind shift was I created a new vision for my life and set new goals. This helped me to focus forward and not on my past or my pain. It opened me to my life and to my future. 3. If every person that comes into our lives is truly an opportunity for us to learn and grow, what do you believe your ex was there to teach you? I believe my ex was there to teach me that I am responsible for my life! My life, my goals and my dreams are 100% my responsibility and no one else’s. No one can save me or rescue me. No one can fix my life or make me happy. My focus is on becoming Lindy, living my best life and being financially independent, self-empowered and self reliant. 4. Ingrid Bergman famously said, "Success is getting what you want; happiness is wanting what you get." What do you have today that you wouldn't have imagined could make you so happy? I have my business and my website. I would have never taken such a bold and brave step had I not had the breakup. I have been invited to speak. I am a media source. I coach others. I will also be publishing my first book later this year (Finding Your Power Through Your Pain). There is just so much I have gained. My pain has truly been my gain. My breakup was my breakthrough and my blessing. Now it is affording me the ability to bank from it. It doesn’t get any better than that. I am in a much better place now. As I always say, "never bitter, only better." My motto is you should never leave a breakup empty handed! Or, as my gran would say, you should never waste it. So, I am cashing in on it. 5. How did you grow up and grow into yourself because of the relationship? This may sound cliché, but my breakup was the best thing that happened to me. Because, it got me to take a long hard look at myself, really go inward, reconnect with myself and cultivate a different kind of relationship with myself. Without sounding overly dramatic, it gave me my life back. Seriously, it gave me the opportunity to step into my greatness and build my dream. While I was in the relationship I had become so disconnected from who I was. I lost me. If I'm being honest, I fell asleep at the wheel in my life. I became a passenger in my own life. So, going from “we” back to “me” was like coming home to myself. So much of our sense of self merges with the other person in a relationship that you lose sight of who you are. And when the relationship ends you find yourself spiraling. You feel so lost and out of sorts. When I finally got back in the driver’s seat of my life and came back into myself, I realized that this breakup had matured me in ways that I didn’t really expect. I had grown so much. I wasn’t as angry and bitter like I would have been in the past. Yes, I was disappointed because I had let a relationship dominate my life. That said, instead of resisting my breakup, I learned to embrace and welcome it. It gave me new and fresh eyes to look at myself and what I wanted. I found a new way of being in my life. Best of all, I was able to invest my time into myself and make me a priority in my life again. So through my loss, I learned to love myself. At the end of the day, my breakup made me see what was out of alignment in my life. I was so blinded by the relationship that I didn’t notice that I was not living in alignment. My breakup helped me to get back in touch with me. It forced me to be real, honest, raw and vulnerable with myself. I remember telling myself, Lindy don’t waste this experience. The old Lindy would have been hell-bent on revenge. Hands down, I am who I am today because of my breakup. My breakup was for my good. 6. One of the most popular sayings is, time heals all wounds. What did you discover over time that helped you heal your wounds most? I disagree. Time alone is not enough. You can’t just sit back and expect your wounds to heal and everything will be fine. It doesn’t work like that. I believe it’s what you do with that time that makes all the difference. It did for me. I made a choice. I decided that even though I was heartbroken and hurt, I was not going to let my breakup break me. I had a chance to do my breakup differently. And I was not going to miss the opportunity to do my breakup my way. What I realized was the only way to heal my hurt was to face my heartbreak head on. My biggest discovery was that even though I didn’t have control over my breakup, I did have control over how I handled it. That was powerful. Yes, I was blindsided by a breakup. But I was not my breakup. I wasn’t going to let my breakup define me. I told myself, that there would be good days, bad days and real ugly days. So, just having that awareness was so empowering because I knew what was coming. This gave me the choice of how I responded to the flood of emotions when they surfaced. Was it easy? No. Was it painful? Yes. Even though this was not my first breakup it was still difficult. I had seen myself with this person for the rest of my life. I truly thought that this was my last relationship. I mean I’m older and wiser now. They say that experience is a great teacher and it is. But, there were days that all I did was cry and question everything about myself. There were so many emotions that came up. I grappled with not being good enough, not being pretty enough and wondered if I did enough. Honestly, I doubted myself. I didn’t know my worth or my value back then. I had dropped the ball in my life and I allowed things that I shouldn’t have. During the early stages of my breakup I tried to stuff down my emotions. I distracted myself with food, work, and shopping. I isolated myself and withdrew from my family and friends. I just didn’t want all the questions. Then it hit me that living this way was not serving me. He had probably moved on with someone else and was living his best life. For me to move on I had to take charge of my healing. So instead of trying to stuff down my emotions and numb the pain I allowed myself to feel my feelings fully. This is when things changed and I started to let go of the hurt. My breakup became my friend. 7. Coming out of your breakup, is there anything you could have done that would have gotten you to where you are now, only more quickly? If so, what would that have been? No, I don’t think so. I believe everything happens in its own time. There is a reason for everything. Looking back, it would have been easy to say I should have walked away sooner. But had I walked away sooner, I honestly don’t think we would be having this conversation. I would not have started my business or my website. My breakup was the catalyst for my business. It has made me who I am today. I am a more confident and stronger version of myself because of my breakup. This is the power of a breakup. I believe, that this is the exact way it was meant to happen and not a minute sooner. At the end of the day, I wouldn’t have changed a thing or done anything differently. 8. What would you tell someone who was in need of finding the silver lining in their breakup? The only way to find the silver lining in your breakup is going through the storm. I love rainbows. As we know rainbows usually appear after a storm. You have to go through your breakup to find your silver lining… to find your rainbow. The other key thing to keep in mind is that a breakup is a loss. So, it’s important to grieve the loss and to experience the storm of feelings and emotions. It’s all part of the bounce back process. I believe that in your wallow is where you find wisdom. The key is to allow yourself the time and space to “wallow”. Give yourself a timeframe to wallow. Wallowing is necessary. Once you’ve had your moment then you need to make up your mind that you’re going to win, not wallow. So when you’re ready you can switch your focus to more productive pursuits and move on. The other thing is, you may not have had control over your breakup. But you do have control over how you move on from it. The choice is yours. Do or don’t do, it’s still a choice. So, you can choose to let your breakup break you or build you. The thing is, when you take responsibility for your life, you become powerful beyond measure. That is when true healing can begin. Like I say, own it, be over it and move on from it. 9. If you could say or ask one last thing to your ex, what would you rather do? And what would the statement or question be? 10. In your opinion, what does it mean to Breakupward? What would that look like to you? I love words. When you look at the definition of the word upward it means “toward a higher place, point, or level”. So to me, breakupward means that there is an upside to breakups if you choose to see the silver lining. It means you have a choice of how you handle your breakup. You can either allow your breakup to crush you or you can use it to elevate you and take you to your higher place or the next level in your life. Breakups have the power to transform you and move you forward. One of my words for this year has been level up. By that I mean learning the lessons my life is teaching me and then using them to go to my next level. I am leveling up in life, love and learning. I have a renewed sense of purpose. I feel empowered. I’m living my life with intention. I’m trusting my intuition and living in alignment with who I am. Banking from Breakup has truly been my breakupward. Because I refused to let my breakup beat me! I am just competitive like that. Connect with Lindy yourself on Twitter. To explore her coaching website and services, visit bankingfrombreakup.com. 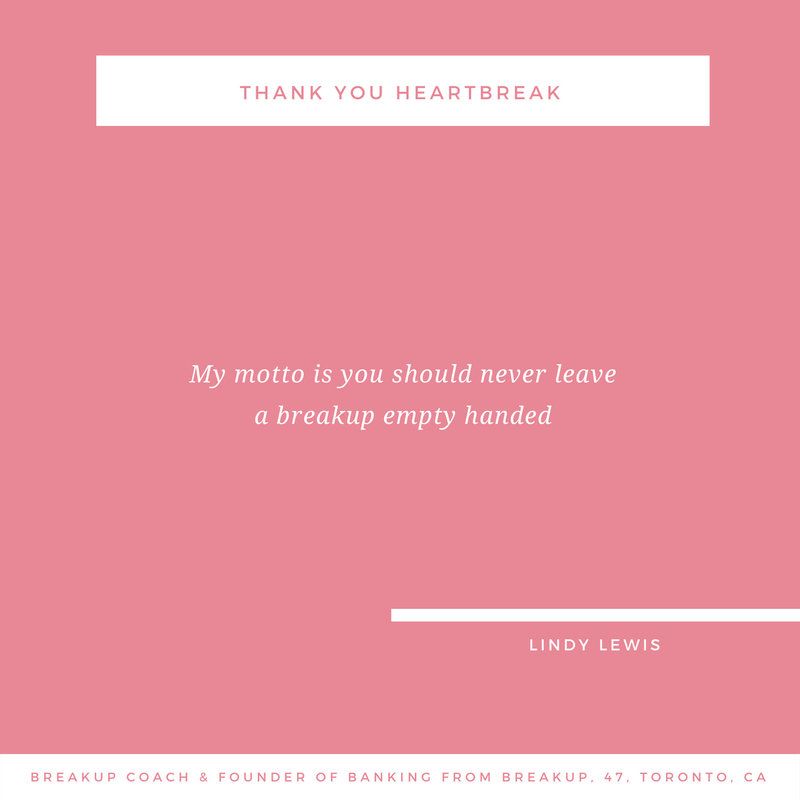 Email her directly at [email protected] If you're interested in changing the way you look at your breakup right now, grab your copy of her Banking from Breakup Manifesto as a thank you gift. Also, be on the lookout for her new book, "Finding Your Power and Purpose Through Your Pain," which will be released on Amazon later this year. A Breakup Coach trained and certified in Solution-Focused Life Coaching, Chelsea Leigh Trescott helps her clients save their relationships or save themselves. 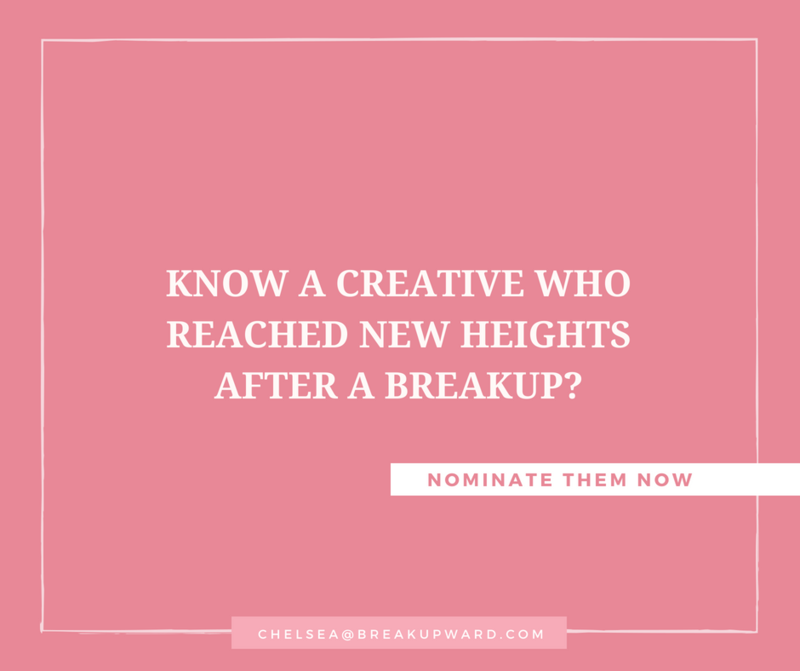 For a chance to be featured in her Mogul Q&A series, HuffPo advice column, or podcast Thank You Heartbreak write [email protected] or reach out on Instagram. For her coaching services, including e-coaching services, visit Breakupward.com. Amy Taylor and 9 others upvoted this.